Nah,if photoshopped it seems they would have added more to the picture than they did! They should have advertised it as a basketball scrimmage & filled the stadium. About mid way through the third quarter of a close game, the PA announcer said that everyone with ticket stub to the football game would be admitted free to the blue and white basketball scrimmage that was about to start. The vast majority of the UNCheat fans at the football game left to attend a friggin' inter-squad basketball scrimmage. believe in football.....and fans left in the 3rd quarter to go watch the Blue and White bsketball game. That's embarrassing even for UNC. That's attendance for someone like Dartmouth and even then I think Dartmouth would put more fans in the stadium for a spring game. Even with a new coach! I don't see 1568 bodies in that stadium. Does that include all the bodies on the field who are--for all essential purposes--required or even PAID to be there? Gotta figure that any D1 program has 2-300 athletes, coaches, interns, managers, trainers, photographers, etc. They added all the people watching on Facebook Live too. that is 80% of what they get for real games. so - not so bad. and have more support. then - they will be great! They were at the library studying for their fake classes. 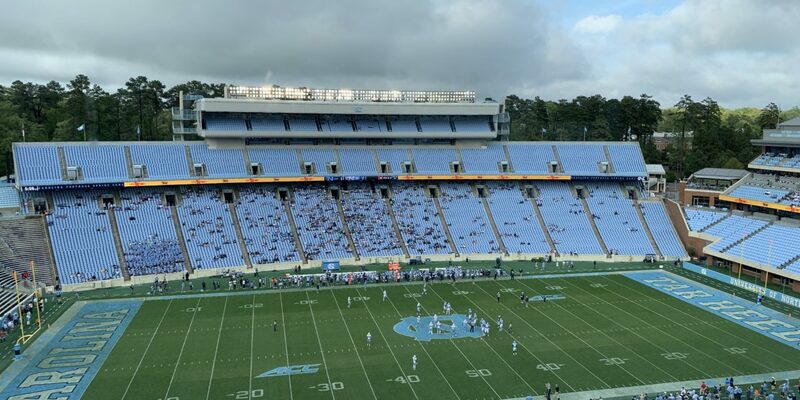 We had more recruits at our spring game than UNC had fans. To their defense, thunderstorms were called for all day in the area and let up just in time for kickoff. But that was about 45 min before kick off. Still not a good crowd but it wasn’t as bad as the picture indicated. Be aware that Mack does not have an albatross like Muschamp running his defense this time, so he might be a lot better than he was at Texas. Who are the darker blue blotches below the 20-yard line? A little, but still embarrassing. I guess Mack's just not that big a draw anymore. Don't know if he's a football fan or is knowledgeable about the game, but a better gimmicky hire would have been Peter Dinklage (Tyrion Lannister on GOT). Who WOULDN'T show up to see the only 4'-5" HC in college FB?